Narodny, the Russian, sat in his laboratory. Narodny’s laboratory was a full mile under earth. It was one of a hundred caverns, some small and some vast, cut out of living rock. It was a realm of which he was sole ruler. In certain caverns garlands of small suns shone; and in others little moons waxed and waned as the moon waxed and waned over earth; and there was a cavern in which reigned perpetual dawn, dewy, over lily beds and violets and roses; and another in which crimson sunsets baptized in the blood of slain day dimmed and died and were born again behind the sparkling curtains of the aurora. And there was one cavern ten miles from side to side in which grew flowering trees and trees which bore fruits unknown to man for many generations. Over this great orchard one yellow sun-like orb shone, and clouds trailed veils of rain upon the trees and miniature thunder drummed at Narodny’s summoning. Narodny was a poet – the last poet. He did not write poems in words but in colors, sounds, and visions made material. Also he was a great scientist – the greatest in his peculiar field. Thirty years before, Russia’s Science Council had debated whether to grant him the leave of absence he had asked, or to destroy him. They knew him to be unorthodox. How deadly so they did not know, else after much deliberation, they would not have released him. It must be remembered that of all nations, Russia then was the most mechanized; most robot-ridden. He had gone, and he had been lost to sight by all. In a few years he was forgotten. Fifteen years ago, unknown and under another name, he had entered America and secured rights to a thousand acres in what of old had been called Westchester. He had picked this place because investigation had revealed to him that of ten localities on this planet it was most free from danger of earthquake or similar seismic disturbance. The man who owned it had been whimsical; possibly an atavism – like Narodny, although Narodny would never have thought of himself as that. At any rate, instead of an angled house glass such as the thirtieth century built, this man had reconstructed a rambling old stone house of the nineteenth century. Few people lived upon the open land in those days; and they had withdrawn into the confines of the city-states. New York, swollen by its meal of years, was a fat belly full of mankind still many miles away. The land around the house was forest covered. A week after Narodny had taken this house, the trees in front of it had melted away leaving a three-acre, smooth field. It was not as though they had been cut, but as though they had been dissolved. Later that night a great airship had appeared upon this field – abruptly, as though it had blinked out of another dimension. It was rocket-shaped but noiseless. And immediately a fog had fallen upon airship and house, hiding them. Within this fog, if one have seen, was a wide tunnel leading from the air-cylinder’s door to the door of the house. And out of the airship came swathed figures, ten of them, who walked along that tunnel, were met by Narodny and the door of the old house closed on them. A little later they returned, Narodny with them, and out of an opened hatch of the airship rolled a small flat car on which was a mechanism of crystal cones rising around each other to a central cone some four feet high. The cones were upon a thick base of some glassy material in which was imprisoned a restless green radiance. Its rays did not penetrate that which held it, but it seemed constantly seeking, with suggestion of prodigious force, to escape. For hours the strange thick fog held. Twenty miles up in the far reaches of the stratosphere, a faintly sparkling cloud grew, like a condensation of cosmic dust. And just before dawn the rock of the hill behind the house melted away like a curtain that had covered a great tunnel. Five of the men came out of the house and went into the airship. It lifted silently from the ground, slipped into the aperture and vanished. There was a whispering sound, and when it had died away the breast of the hill was whole again. The rocks had been drawn together like a closing curtain and boulders studded it as before. That the breast was now slightly concave where before it had been convex, none would have noticed. All were one with Narodny in indifference to the world; each with him in his viewpoint on life; and each and all lived in his or her own Eden among the hundred caverns except when it interested them to work with each other. Time meant nothing to them. Their researches and discoveries were solely for their own uses and enjoyments. If they had given them to the outer world they would have only been ammunition for warfare either between men upon Earth or Earth against some other planet. Why hasten humanity’s suicide? Not that they would have felt regret at the eclipse of humanity. But why trouble to expedite it? Time meant nothing to them because they could live as long as they desired – barring accident. And while there was rock in the world, Narodny could convert it into energy to maintain his Paradise – or to create others. But deep down in earth, within the caverns, there were music and song and mirth and beauty. Gossamer nymphs circled under the little moons. Pan piped. There was revelry of antique harvesters under the small suns. Grapes grew and ripened, were pressed, and red and purple wine was drunk by Bacchantes who fell at last asleep in the arms of fauns and satyrs. Oreads danced under the pale moon-bows, and sometimes Centaurs wheeled and trod archaic measures beneath them to the drums of their hoof upon the mossy floor. The old Earth lived again. Narodny listened to drunken Alexander raving to Thais among the splendors of conquered Persepolis; and he heard the crackling of the flames that at the whim of the courtesan destroyed it. He watched the siege of Troy and counted with Homer the Achaean ships drawn up on the strand before Troy’s walls; or saw with Herodotus the tribes that marched behind Xerxes – the Caspians in their cloaks of skin with their bows of cane; the Ethiopians in the skins of leopards with spears of antelope horns; the Libyans in their dress of leather with javelins made hard by fire; the Thracians with the heads of foxes upon their heads; the Moschians who wore helmets made of wood and the Cabalians who wore the skulls of men. For him the Eleusinian and the Osirian mysteries were re-enacted, and he watched the women of Thrace tear to fragments Orpheus, the first great musician. At his will, he could see the rise and fall of the Empire of the Aztecs, the Empire of the Incas; or beloved Caesar slain in Rome’s Senate; or the archers at Agincourt; or the Americans in Belleau Wood. Whatever man had written – whether poets, historians, philosophers or scientists – his strangely shaped mechanisms could bring before him, changing the words into phantoms real as though living. He was the last and greatest of the poets – but also he was the last and greatest of the musicians. He could bring back the songs of ancient Egypt, or the chants of more ancient Ur. The songs that came from Moussourgsky’s soul of Mother-earth, the harmonies of Beethoven’s deaf brain, or the chants and rhapsodies from the heart of Chopin. He could do more than restore the music of the past. He was master of sound. To him, the music of the spheres was real. He could take the rays of the stars and planets and weave them into symphonies. Or convert the sun’s rays into golden tones no earthly orchestras had ever expressed. And the silver music of the moon – the sweet music of the moon of spring, the full-throated music of the harvest moon, the brittle crystalline music of the winter moon with its arpeggios of meteors – he could weave into strains such as no human ears had ever heard. 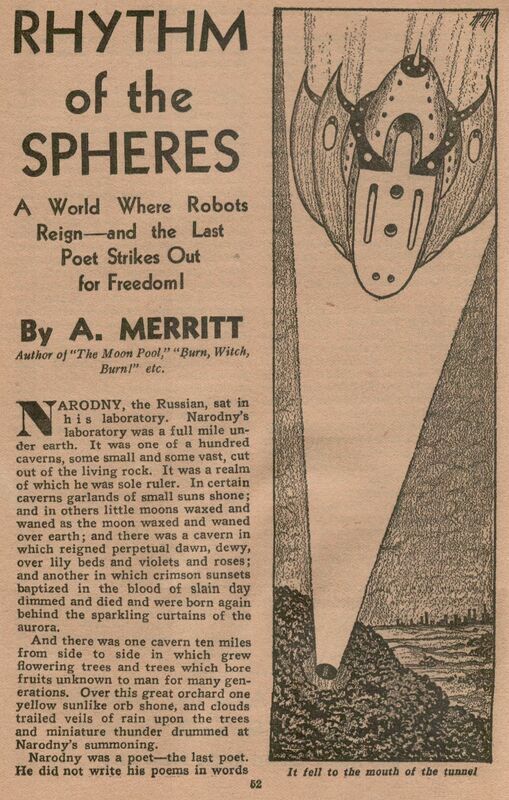 It so happened that on that night when the Ruler of Robots had experimented with a new variety of ray – a space warper – Narodny had been weaving the rays of Moon, Jupiter and Saturn into Beethoven’s Moonlight Symphony. The moon was a four day crescent. Jupiter was at one cusp, and Saturn hung like a pendant below the bow. Shortly Orion would stride across the Heavens and bright Regulus and red Aldebaran, the Eye of the Bull, would furnish him with other chords of starlight remoulded into sound. After a time the little moons began to glow again, but dimly; and from the tonal mechanisms came broken, crippled music. Narodny stirred and sat up, his lean, high-cheeked face more Satanic than ever. Every nerve was numb; then as they revived, agony crept along them. He sat, fighting the agony, until he could summon help. He was answered by one of the Chinese. Down in the chamber of screens, Narodny laughed again. He said: “Lao, is it that we have advanced so in these few years? Or that men have retrogressed? No, it is the curse of mechanization that destroys imagination. For look you, how easy is this problem of the robots. They began as man-made machines. Mathematical, soulless, insensible to any emotion. So was primal matter of which all on earth are made, rock and water, tree and grass, metal, animal, fish, worm, and men. But somewhere, somehow, something was added to this primal matter, combined with it – used it. It was what we call life. And life is consciousness. And therefore largely emotion. Life establishes its rhythm – and its rhythm being different in rock and crystal, metal, fish, and so on, and man, we have these varying things. “Well, it seems that life has begun to establish its rhythm in the robots. Consciousness has touched them. The proof? They have established the idea of common identity – group consciousness. That in itself involved emotions. But they have gone further. They have attained the instinct of self-preservation. They are afraid mankind will revolt against them. And that, my wise friend, connates fear – fear of extinction. And fear connates anger, hatred, arrogance – and many other things. The robots, in short, have become emotional to a degree. And therefore vulnerable to whatever may amplify and control their emotions. They are no longer mechanisms. The hill behind where the old house had stood trembled. A circle of pale green light gleamed on its breast. It dimmed, where it had been was the black mouth of a tunnel. An airship, half-rocket, half-winged, making its way to New York, abruptly drooped, circled, fell gently like a moth, close to the yawning mouth of the tunnel. Its door opened, and out came two men, pilots, cursing. There was a little sigh from the tunnel’s mouth and a silvery misty cloud sped from it, over the pilots and straight through the opened door. The pilots staggered and crumpled to the ground. In the airship half a dozen other men, slaves of the robots, slumped to the floor, smiled, and died. The flashing green bracelets encircled the appendages and excised them. The pair were marched away. The bodies of the others were taken apart, studied and under Narodny’s direction curious experiments were made. Music filled the cavern, strange chords, unfamiliar progressions, shattering arpeggios and immense vibrations of sound that could be felt but not heard by the human ear. And finally this last deep vibration burst into hearing as a vast drone, hummed up and up into swift tingling tempest of crystalline brittle notes, and still ascending passed into shrill high pipings, and continued again unheard, as had the prelude to the droning. And thence it rushed back, the piping and the crystalline storm reversed, into the drone and the silence – then back and up. The unheard note began, droned up and through the tempest and away and back again. And up and down – and up and down, though not so loudly as before. And suddenly the feet of the robots began to move, to shuffle. Their leg-joints bent; their bodies swayed. The note seemed to move now here and now there about the chamber, and always following it, grotesquely. Like huge metal marionettes, they followed it. The music ended in the crashing note. 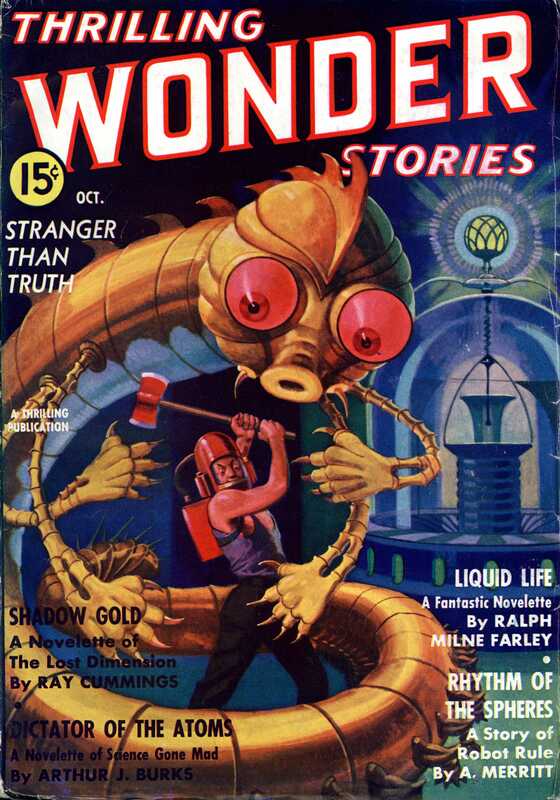 And it was as though every vibrating atom of the robot bodies had met some irresistible obstruction. Their bodies quivered and from their voice mechanisms came a shriek that was hideous blend of machine and life. Once more the drone, and once more and once more and again the abrupt stop. There was a brittle crackling all over the conical heads, all over the bodies. The star shaped splinterings appeared. Once again the drone – but the two robots stood, unresponding. For through the complicated mechanisms which under their carapaces animated them were similar splinterings. It was exactly at noon next day that over all North America a deep inexplainable droning was heard. It seemed to come not only from deep within earth, but from every side. It mounted rapidly through a tempest of tingling crystalline notes into a shrill piping and was gone. Then back it rushed from piping to drone; then up and out and down. Again and again. And all over North America the hordes of robots stopped in whatever they were doing. Stopped – and then began to dance – to the throbbing notes of that weirdly fascinating music – that hypnotic rhythm that seemed to flow from the bowels of the earth. They danced in the airships and scored of those ships crashed before the human crew could gain control. They danced by the thousands in the streets of the cities – in grotesque rigadoons, in bizarre sarabands; with shuffle and hop, and jig the robots danced while the people fled in panic and hundreds of them were crushed and died in those panics. In the great factories, and in the tunnels of the lower cities, and in the mines – everywhere the sound was heard – and it was heard everywhere – the robots danced… to the piping of Narodny, the last great poet… the last great musician. Then suddenly the dreadful droning, the shattering tempest, the intolerable high piping ended. And everywhere the people fell, sleeping among the dead robots, as though they had been strung to the point of breaking, sapped of strength and abruptly relaxed. And as though it had vanished from Earth, America was deaf to cables, to all communication beyond the gigantic circle of sound. But that midnight over all Europe the drone sounded and Europe’s robots began their dance of death… and when it had ended a strange and silent rocket ship that had hovered high above the stratosphere sped almost with the speed of light and hovered over Asia – and next day Africa heard the drone while the black answered it with their tom-toms – then South America heard it and last of all far off Australia… and everywhere terror trapped the peoples and panic and madness took their grim toll. And Narodny shook his head, doubtfully. But soon harmonies were swelling through the great cavern of the orchards, and nymphs and fauns dancing under the fragrant blossoming trees – and the world again forgotten by Narodny.